Discount retailer ALDI has released its first water protection policy – ALDI Nord and ALDI SÜD are releasing a joint water protection policy for the first time. The policy forms part of the integrated water protection commitment that both discount stores have undertaken – Via the joint policy the discount stores will determine binding measures for using water responsibly, with a focus on the supply chains for fruit and vegetables, as well as textiles. In addition, both corporate groups have joined the Alliance for Water Stewardship (AWS) – the biggest network in the world for sustainable water use. The discount stores are increasing their current commitment to water protection, for example with respect to the textiles supply chain. Here, ALDI Nord and ALDI SÜD have been able to reduce their water footprint by more than 12% since 2016 by using environmentally-friendly fibres. In a pilot project with the certification system GLOBALG.A.P, the discount stores are testing the SPRING (Sustainable Program for Irrigation and Ground Water Use) add-on certification with selected international producers for the first time. The SPRING module reviews water criteria and is used to assess, follow up on, and optimise sustainable water management in the supply chain. As part of ALDI’s internal producer audit, data relating to water management has been requested in addition to data relating to working and social standards since autumn 2018. ALDI Nord and ALDI SÜD have also carried out ‘hot-spot analyses’ for best-selling and water-critical fruit and vegetable items such as avocados and bananas. With the aid of the Water Risk Filter from the World Wide Fund for Nature (WWF), the retailer was able to determine the water-related risks in the supply chain for more than 2,000 producers that supply ALDI. Using the results, water management can be taken into account and improved for the products. 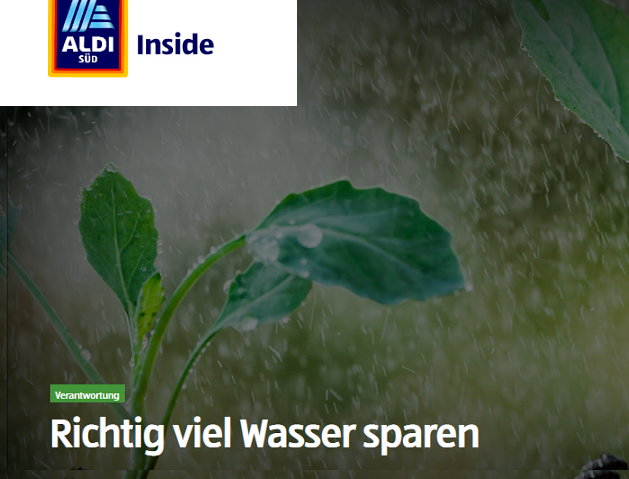 To safeguard water quality, ALDI Nord and ALDI SÜD want to reduce the use of plant protection products when growing fruit and vegetables. To do so, the discount stores have introduced comprehensive residue monitoring and the retailer is no longer using solid microplastics and opacifiers in own-brand cosmetics and personal care products. Together with ClimatePartner, ALDI SÜD is also supporting two drinking water projects for climate protection in Uganda and Cambodia to give the local population access to clean drinking water.